There is a wide complex, followed by a narrow complex, followed by a wide complex. The rate is 174. The rhythm alternates between a wide complex (first 4 beats, and beats 16-28) and narrow complex (beats 5-15). There are no P-waves. Are the wide complexes due to a supraventricular rhythm (AVNRT or Atrial flutter or atrial fib) with aberrancy? Or are they due to ventricular tachycardia (VT). Favoring VT: They are VERY wide, and the initial part of the QRS is quite wide in places. For instance, in V4 the onset of the R-wave to the nadir of the S-wave is 90 ms. This would normally imply VT. 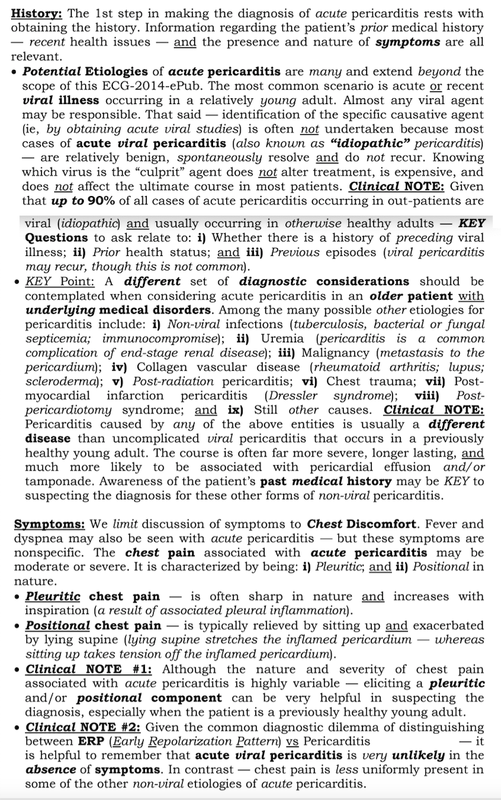 However, there is one feature that is diagnostic for SVT with aberrancy. What is it?? Answer: If you use a caliper, the rate of the 2 different morphologies is the same. It would be a nearly impossible coincidence that a rhythm of SVT would have the exact same rate as a VT rhythm. Now there is atrial fib with RVR, and the same QRS morphology as the narrow complex rhythm above. What was the first rhythm? If you take the time to measure every RR interval, as Ken Grauer did (see below), you will find that there is slight variation in all of them. So it appears that the initial rhythm was atrial fib with aberrancy. The amiodarone will slow AV conduction and lead to a slower ventricular rate, make it slow enough that there is no aberrancy, and make it obviously irregular. Interesting rhythm — in which the tachycardia alternates from a wide to narrow QRS complex. I agree with Dr. Smith — that the mechanism of the initial rhythm is supraventricular — though my approach was a bit different. Rhythms like this are great subjects for discussion, and there will often be more than a single viewpoint. For clarity — I’ve reproduced and labeled the initial ECG in this case (Figure-1). Figure-1: The initial ECG in this case. BLACK numbers in the long lead II rhythm strip indicated selected R-R interval measurements — with the thin RED vertical lines showing the consistent spot at the beginning of QRS complexes from where I measured (See text). As per Dr. Smith — there is a tachycardia at ~170/minute with alternating wide and narrow complexes. Sinus P waves are absent. Although there is some notching seen after the QRS complexes in leads II and III when the QRS complex is wide — I do not think this represents retrograde atrial activity. Instead — my hunch is that this notching is simply part of the QRS complex. Although not specifically mentioned — we can assume that this patient was hemodynamically stable, because he/she was treated medically with Amiodarone. One benefit of this medication — is that it may be effective for both ventricular and supraventricular tachyarrhythmias. A KEY to rhythm analysis at this point — is to determine IF the rhythm is regular or not, especially just before and just after QRS width changes. CONFESSION: I spent no less than half an hour measuring and comparing R-R interval duration throughout this tracing. Reasons that this was so challenging include the rapid rate throughout the tracing — the less than distinct onset in the long lead II of beats with QRS widening — and the overlap with the exceedingly deep S waves in lead V3 that coincided with that elusive onset of widened QRS complexes that began again with beat #16. BOTTOM Line: To my measurement — the R-R interval does not stay constant throughout the tracing! So as not to overly “clutter” the tracing — I limited millisecond measurements to just those needed to demonstrate that there is some variability. Most R-R intervals in this tracing measure 360 msec (ie, beats #1-thru-4; and then virtually all beats after beat #17). The first 4 beats in this tracing are wide. Beats #5-thru-15 are narrow. QRS widening resumes with beat #16 — and persists until the end of the tracing. But the R-R interval preceding the first narrow beat ( = the R-R interval between beats #4-5) is slightly longer ( = 390 msec) than the 360 msec R-R interval for the preceding 4 wide beats. 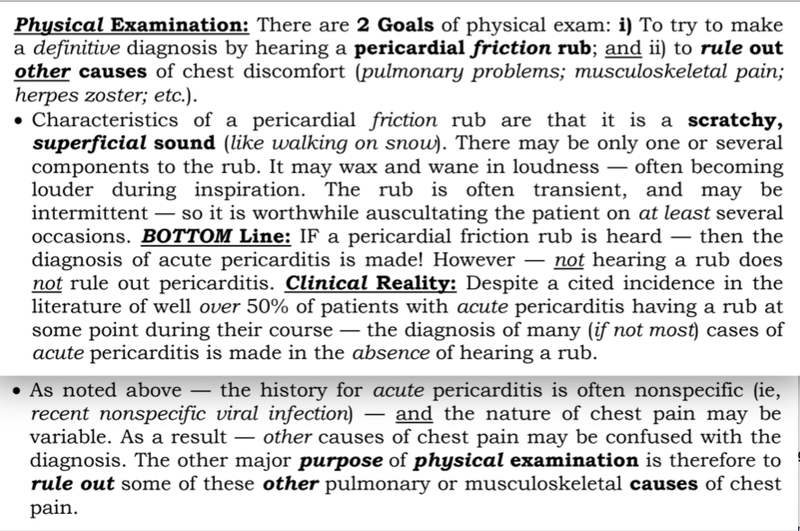 This suggests that the reason that the QRS narrows beginning with beat #5 might be a rate-related type of aberrant conduction. Admittedly — the R-R interval then shortens (ie, to 310 and 320 msec) — but it may happen with aberrant conduction that shortening after a longer R-R interval might not necessarily immediately alter QRS morphology. There seems to be some variability in R-R interval duration for a number of beats in the narrow run. That this is true is easiest to see near the top of the tracing in leads aVR and V1. Even without caliper measurement — it should be evident that there is a difference in R-R intervals for the lettered durations A — B — C — D — and E. So, at least during this part of the tracing — since there is some irregular irregularity to this rhythm, but no P waves — which suggests this is probably rapid AFib! The PEARL — is that when AFib is rapid, parts of the tracing often look regular — but are not truly regular when measured with calipers. In support of a rate-related relationship for aberrant conduction in this tracing — note that QRS widening resumes with beat #16 — and the R-R interval just preceding beat #16 (labeled D) is the shortest R-R interval on the entire tracing! QRS morphology is completely typical for LBBB aberration because: i) There is a monophasic R wave in lateral leads I and V6; and, ii) There is predominant negativity in lead V1 (as well as in other anterior leads). Although the rate of wide and narrow tachycardias is not identical throughout the entire tracing — the rates are very similar and, there is no post-ectopic pause when QRS morphology changes from wide-to-narrow, and then back from narrow-to-wide. VT is much more likely to manifest at least a slight pause when runs stop. There is a reason for aberrant conduction! That is, a rate-related relationship is suggested — because the longest R-R interval (390 msec between beats #4-5) precedes the switch-over to a narrow QRS — and the shortest R-R interval (labeled D, between beats #15-16) precedes the switch back to a wide QRS complex. CLINICAL NOTE: Obviously, in “real life” — there is not time with a sick, tachycardic patient like this one to say, “Stop while I pull out my calipers”. Fortunately — There is NO need to! Even without making measurements — I suspected very quickly that a supraventricular mechanism was likely because: i) QRS morphology in the 3 KEY leads (leads I, V1 and V6) is so very typical for LBBB — and although not impossible, VT is much less likely to look so typical for LBBB; — ii) The observation of narrow and wide tachycardias having such similar rates without any post-ectopic pause favors a supraventricular mechanism; — and, iii) Since this patient was hemodynamically stable with this tachycardia — treatment with an agent such as Amiodarone that may be effective for both VT and supraventricular rhythms is appropriate even before you know a definitive diagnosis. P.S. — I believe parts of this tracing represent rapid AFib. Other parts looked to be regular — so I wasn’t sure if there might not be some transition between a regular reentry SVT rhythm and AFib. Clinically though, this uncertainty wouldn’t alter the initial treatment approach. P.P.S. — It is of interest that the reason why there is so much overlapping of S waves from leads V2 and V3 in Figure-1 — is that this patient has marked LVH! In general — it is clearly more difficult to assess for LVH in the presence of LBBB — because this conduction disturbance alters the sequence of both depolarization and repolarization. As a result — both voltage criteria and ST-T wave changes of LV "strain" are different when evaluating a patient with LBBB. That said — the finding of VERY deep anterior S waves (ie, ≥25-30mm in any one or more of the anterior leads V1,V2,V3) is predictive of LVH despite the presence of LBBB. In further support of LVH in Figure-1 — note increased voltage, as well as repolarization changes consistent with "strain" (or a "strain"-equivalent) on the 2 ECGs done after QRS widening resolved. And, the fact that this patient has such marked LVH perhaps accounts for slight delay in the descent of those anterior S waves in Figure-1 during the run of wide QRS beats ( = beats #16-22 — with a thicker ventricle requiring more time for the impulse to pass, therefore a less steep initial descent for the QRS in anterior leads). For more on the phenomenon of Rate-Related Aberrant Conduction — CLICK HERE. A former resident sent this. He asked: "Hey Steve, Wanted to get your thoughts on this EKG:"
Here was my response: "Leads I and aVL bother me (some ST depression), but the rest of it looks totally normal." He then went on to say: "40-something with chest pain for one hour. Had episode of nausea and dizziness when it started. Burning pain subxiphoid and into throat." But ST depression in I and aVL is abnormal. It does not usually represent subendocardial ischemia, but rather it is usually reciprocal ST depression, reciprocal to inferior ST elevation. There is no ST elevation in inferior leads, but it may just be too early to manifest. 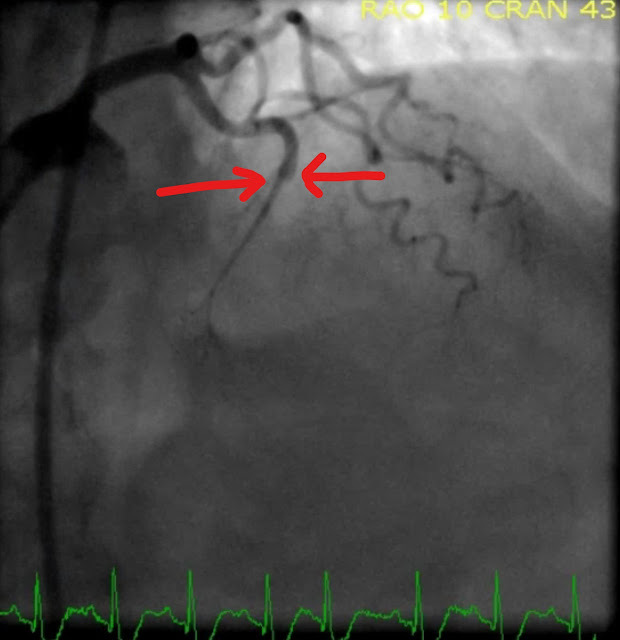 Now there is new STE in inferior leads and much more obvious ST depression in I and aVL. 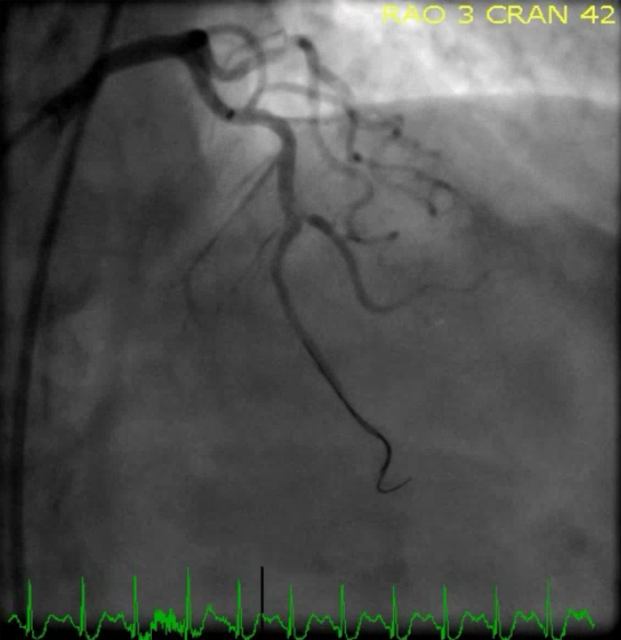 Cath lab was activated and a 100% RCA occlusion was found. 1. Beware ST depression in I and aVL. It may be the first sign of inferior ST elevation. I liked this case — because it provides unique insight on recognition of a subtle abnormality. It also provides me a forum to reflect on when Q waves, ST depression and T wave inversion may be unassociated with pathology. For clarity — I’ve reproduced the first 2 ECGs that were done in this case in Figure-1. It should be noted that the initial ECG is angled — though this does not impair interpretation. We were shown ECG #1 before being told the history. My interpretation was similar to that of Dr. Smith: There is a fairly marked sinus arrhythmia — there is slightly early transition in the chest leads (lead V3 abruptly becoming all positive) — there are small and narrow q waves in the inferior leads, and in the lateral chest leads — and, there is very subtle but definitely not normal ST segment straightening and slight ST depression in leads I and aVL. Other than nondiagnostic reduced T wave amplitude in leads III and aVF — I saw nothing else that was clearly abnormal. I interpreted the ST-T wave abnormalities in leads I and aVL as “nonspecific” — with the KEY point being that these findings are present in both of the high lateral leads ( = leads I and aVL). Regarding the small q waves — these are most probably not abnormal. It is common and normal to see small and narrow q waves in one or more of the 5 lateral leads (I, aVL; V4, V5, V6) — that simply reflect normal left-to-right septal activation. It is also common and normal to see small septal q waves in 2 or 3 of the inferior leads in patients with a relatively vertical axis (which is estimated to be between +75-80 degrees in Figure-1). BOTTOM Line — Clinical Correlation is needed for interpretation: i) IF a prior ECG on this patient was available — It might tell us if these ST-T wave changes are new or old; ii) IF the patient was without cardiac-sounding chest pain — then the above findings might reflect any of the many potential causes of nonspecific ST-T wave abnormalities; iii) ST segment flattening and/or slight ST segment depression (especially in leads like lead I and aVL that do not usually show ST depression) — may be a sign of chronic or acute cardiac ischemia; and, iv) IF this patient was having new-onset chest pain — then acute cardiac ischemia moves to #1 on our list of differential possibilities! 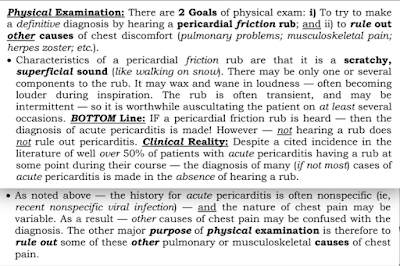 As per Dr. Smith — it could be early in the course of an acute cardiac event, such that other leads aren’t yet showing definite abnormality. I find it instructive whenever possible to practice Lead-by-Lead Comparison of serial tracings — especially in cases like this, in which an acute cardiac event is evolving in front of our eyes! First — Note that there is virtually NO change in frontal plane axis between ECG #1 and ECG #2 — and NO change is seen in R wave progression (or in QRS morphology) as we move across the chest leads. This is important to note — because it tells us that any difference in QRST morphology that we might see between ECG #1 and ECG #2 is a real change, and not due to an axis shift or lead malposition! Second — It is interesting to note that the heart rate is faster and much more regular in ECG #2. As noted by Dr. Smith — the marked sinus arrhythmia that we saw in ECG #1 of this 40-something patient was not necessarily an abnormal rhythm. That said, I’ll speculate ( = purely academic to satisfy my intellectual curiosity) — by commenting that sinus arrhythmia in a younger adult often reflects increased vagal tone — and perhaps (I wasn’t there …) the patient was now having increased symptoms at the time ECG #2 was obtained, leading to a relative increase in sympathetic tone (with as a result, a faster and more regular heart rate). Other than lead aVR — all of the limb leads have shown a similar evolution in ECG #2. That is — each of the inferior leads (II, III, aVF) now clearly shows ST elevation — with reciprocal ST depression in both of the high lateral leads (ie, leads I and aVL). It should be apparent that the “magical” reciprocal (ie, mirror-image) relationship between leads III and aVL is now evident. So despite lack of meaningful evolution in the chest leads (I don’t think the slight decrease in T wave amplitude in lead V2 of ECG #2 is clinically meaningful) — the evolution we see between ECG #1 and ECG #2 in this patient with new-onset chest pain is diagnostic of acute OMI, regardless whether or not numeric criteria for a STEMI have been satisfied. Figure-2: On Q waves and T wave inversion ... (See text). WHEN may Q Waves and T Wave Inversion be Normal? I’ve excerpted the illustration and text in Figure-2 from HERE. 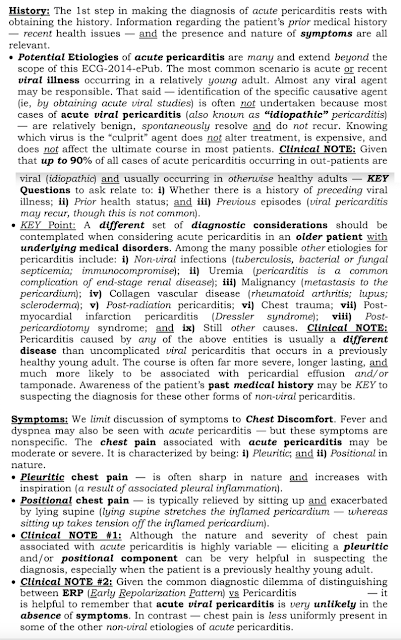 I’ll emphasize that the generalities stated here may not pertain early on in the process in a patient with a worrisome history of new-onset chest pain. There are many potential causes of ST-T wave abnormalities (ie, LV “strain” from LVH; medication effect; electrolyte disturbance; pulmonary embolus, etc.). The generalities stated here for predicting ischemia are much more likely to apply when other factors are minimal. Because 2 of the 3 inferior leads (leads III and aVF) may normally manifest even large Q waves and/or deep T wave inversion — the 3rd inferior lead ( = lead II) exerts an important role in decision-making. Thus, it becomes more likely that inferior ST-T wave changes and Q waves of at least moderate size are significant when such changes are seen in all 3 inferior leads. It is less likely that such changes are significant when they are not seen in lead II. Isolated T wave inversion in lead III, lead aVF and/or in lead aVL is less likely to be ischemic when the QRS complex in the same lead is predominantly negative. 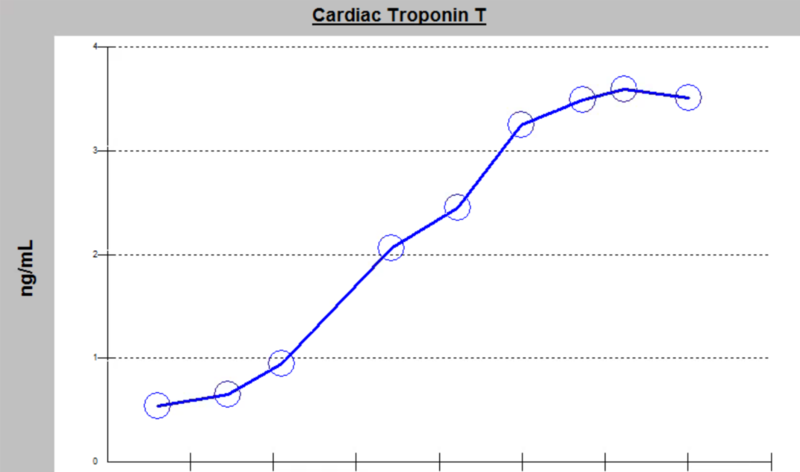 This is because the T wave axis often follows relatively close behind the QRS axis. That said, even when the QRS is predominantly positive — shallow T wave inversion in one of these leads is not necessarily ischemic. BOTTOM Line: No criteria for LVH are met in ECG #1 — so LVH is not a confounding factor. The principal ST-T wave abnormality in this tracing is ST segment straightening and slight ST depression in leads I and aVL. Although isolated T wave inversion in lead aVL would not necessarily be abnormal (especially given the predominantly negative QRS complex in this lead) — there should not be ST flattening with ST depression in both of these high lateral leads. Given the history of new-onset chest pain — this ECG finding is ischemic until proven otherwise. The evolution seen in ECG #2 confirmed our suspicion. An elderly woman presented with acute onset chest pain and shortness of breath. There is sinus rhythm with minimal STE in V1-V3, not meeting STEMI criteria. However, this STE is definitively abnormal in the setting of a normal QRS complex and hyperacute T-wave morphology in V2. 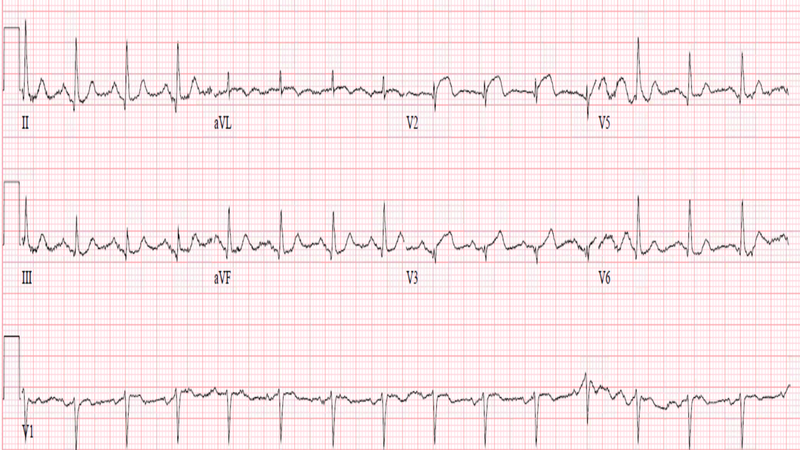 There is a small amount of reciprocal STD in V6 with a negative T-wave. 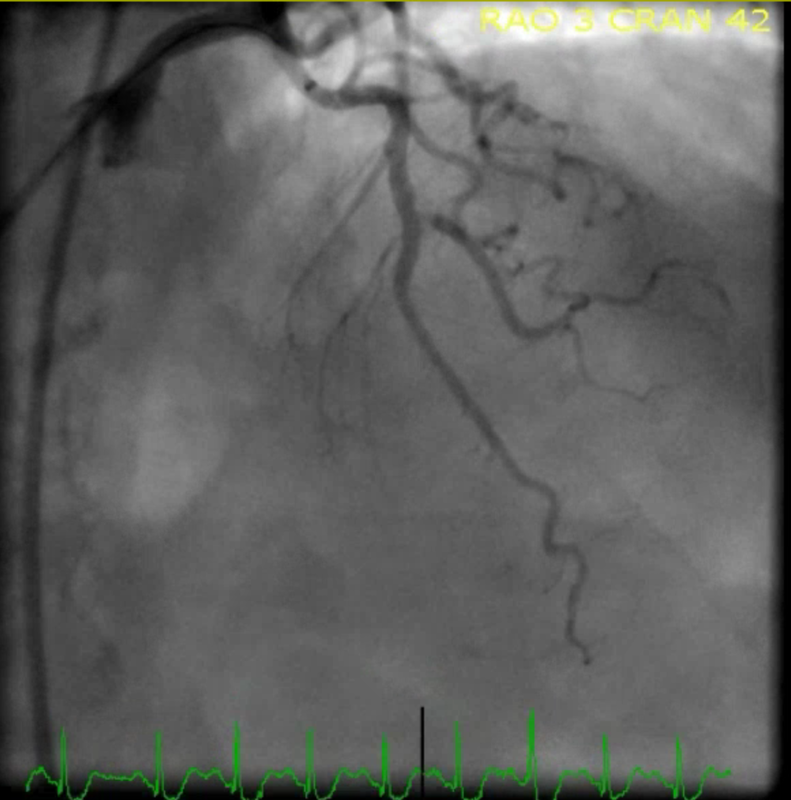 This is subtle but diagnostic for anterior Occlusion MI. V2 never has this appearance in the absence of full thickness ischemia. We called for emergent cath lab activation. LAD now open after intervention. 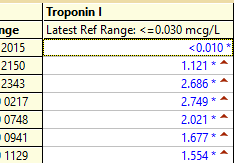 Peak troponin T was 1.76 ng/mL. Convalescent echo showed EF 41% with anterior, lateral, and apical wall motion abnormalities. Given the relatively rapid reperfusion, and the absence of QS-waves, much of the abnormality on echo could be reversible (myocardial stunning, not infarction). Serial ECGs can sometimes turn a difficult decision into a very easy one, but not all OMIs will develop into clear STEMIs quickly, and some OMIs never will manifest STEMI at all. The delay between OMI and STEMI sometimes causes unacceptable loss of myocardium or worse. Make sure to burn the morphology of lead V2 from the initial ECG into your brain so that you can recognize this pattern in the future. STE in V1 with STD in V6 in the presence of a normal QRS complex is another piece of evidence consistent with LAD occlusion. With this case — Dr. Meyers addresses a common theme of this ECG Blog = HOW LONG to wait for your OMI ECG to show a STEMI? As we’ve emphasized before, the important “lesson-to-be-learned” — is that there should not be a need to wait! As soon as there is evidence of acute OMI — your cardiology colleague should be called to expedite cath with the goal of acute reperfusion. 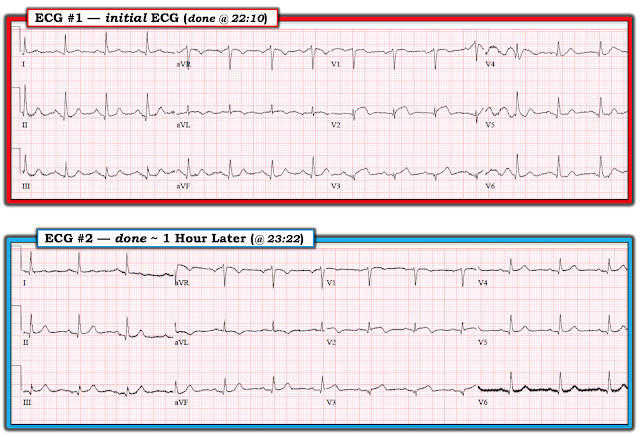 For clarity — I’ve reproduced the first 3 ECGs that were done in this case in Figure-1. In addition to review of why acute OMI is evident from ECG #1 ( = the initial ECG in this case, that was done by EMS on arrival at the patient’s house) — I found serial observation of the lead V2 appearance on these 3 sequential ECGs to be insightful and important to note! Figure-1: The first 3 ECGs shown in this case (See text). 1) The clinical setting was worrisome ( = an elderly woman with new-onset chest pain). 2) Given this history — there is NO way that the ECG appearance of lead V2 in ECG #1 is normal. Relative to the very small QRS amplitude in lead V2 — the ST segment in this lead is disproportionately large, coved in shape (ie,“frowny” configuration) with some ST elevation. This ST-T wave in lead V2 of ECG #1 is clearly hyperacute. It is good to be aware that with acute OMI of the 1st (or 2nd) diagonal branch of the LAD — the only chest lead that may show ST elevation is lead V2. There may be a lesser amount of ST elevation in lead aVL, in association with inferior lead reciprocal ST depression — or — early on, the ECG might look similar to what we see in ECG #1. 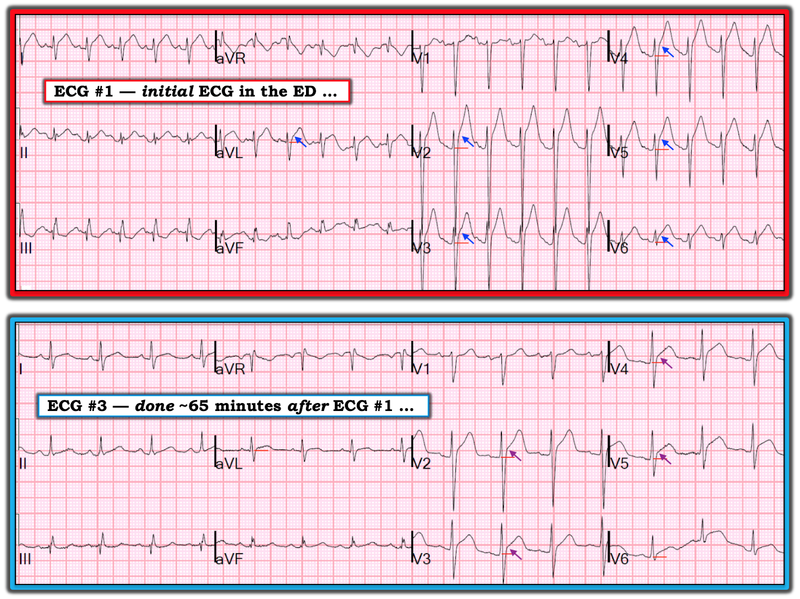 Things can change very quickly during the course of an actively evolving acute OMI (See THIS CASE — in which just 8 minutes passed between the 1st and 2nd ECGs). 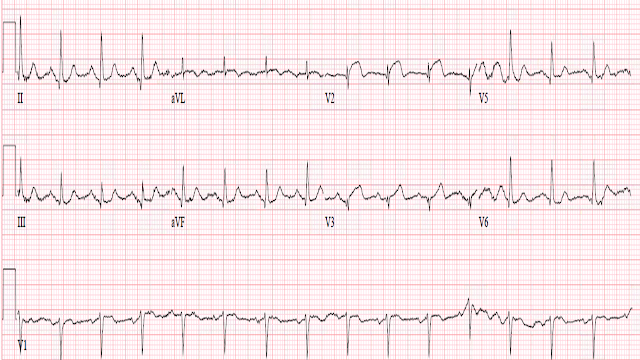 So, early on — acute OMI of the LAD might (and in this case, did) look like ECG #1. I suspect one or more of the 3 anterior leads (V1,V2,V3) in ECG #1 are malpositioned. My reason for this suspicion is that I wouldn’t expect the S wave in lead V2 to decrease by as much as it does from neighboring lead V1 — and then, to become deeper at the same time the r wave is becoming taller, as we move from V2-to-V3. In addition, transition of ST-T wave shape from an upsloping ST segment in V1 — to a downward coving ST segment by V2 — and then back again to an upsloping ST segment by V3, is not the pattern of a usual physiologic progression as one moves from V1-to-V3. The “Take-Home” Point: As per Dr. Meyers — Use of frequent serial ECGs can be invaluable until the clinical picture is clarified. Chest lead malposition is surprisingly common — even when experienced ECG technicians are the ones doing the tracings. Given that the cardiologist in this case was skeptical about the diagnosis of acute OMI from ECG #1 — I would have immediately repeated the ECG as soon as I saw this initial tracing because: i) Some form of anterior lead malposition is suggested (See above) — and, immediate repeat ECG after verifying electrode lead placement might have clarified the true status of acute ST-T wave changes; and, ii) Given this patient’s acute symptoms + strong suggestion of hyperacute ECG changes in lead V2 of ECG #1 — there is a definite possibility that you might already see some evolution of ST-T wave changes within the brief time frame between when ECG #1 was done — and when the repeat ECG is completed. NOTE: The reason I’m suggesting to immediately repeat the ECG — is because we are trying to expedite convincing the cardiologist on this case to take this patient to cath as soon as this can be done. PEARL #1: There is an easy way to eliminate the possibility of chest electrode lead placement variability when serial tracings are done. Simply mark the spot on the chest where electrode leads are placed in cases in which lead malposition is suspected. This should guarantee consistency of electrode lead placement for subsequent serial tracings. PEARL #2: Be aware that change in the ANGLE of the patient’s bed may alter QRS and ST-T wave appearance in any number of leads. This factor is typically ignored (Have you ever seen notation on an ECG that the patient was too dyspneic to lie flat? — and that as a result, his/her bed was raised to 30 degrees [or to whatever angle the bed has been raised to ... ] at the time the ECG was done). It is likely that a different technician recorded each of the 3 ECGs in Figure-1 — since more than one ECG machine was used (black vs red grid lines), and the 3 tracings were recorded at different locations (ie, the patient’s house; the ED; and the cath lab). Lead malposition becomes much more likely when a different person is recording repeat tracings. I’ve already described why I thought lead malposition is likely for ECG #1. Lead malposition is almost certain for ECG #3. One simply would not expect progression from predominant negativity of the QRS in lead V1 — to predominant positivity by lead V2 — to an equiphasic QRS complex by lead V3. And yet another QRS morphology is seen in lead V2 of ECG #2 — in which there is a multiphasic, almost null net QRS complex. Realizing that this patient has just undergone a PCI procedure — I would not expect the marked variation in lead V2 QRS morphology across these 3 tracings to have been caused by coronary reperfusion. Especially in view of fairly consistent QRS morphology in the lateral chest leads (leads V4, V5 and V6) across these 3 tracings — I think it virtually certain that there has been lead malposition (at least for lead V2) in at least one or two of these 3 tracings. BOTTOM Line: As per Dr. Meyers — "Serial ECGs" can sometimes turn a difficult decision (regarding acute cath lab activation or not) into a very easy one. Awareness of how common chest lead malposition is — and, appreciation of when to suspect lead malposition — may prompt earlier repeat ECGs that may help to expedite you being able to convince a reluctant cardiologist of the need for immediate cath.